I am sure you could bring down the calories using buttery spread instead of butter, Splenda instead of sugar, Fat Free evaporated milk instead of whole – – but this dessert just deserves all the ingredients that give it its creamy goodness. Combine the first 6 ingredients in a saucepan and bring to a boil then reduce the heat and simmer 20 minutes or until all the water is absorbed. Stir in the evaporated milk and bring to a boil again then lower the heat and simmer 10 minutes or until it is thick and creamy then add the caramels and stir until melted. 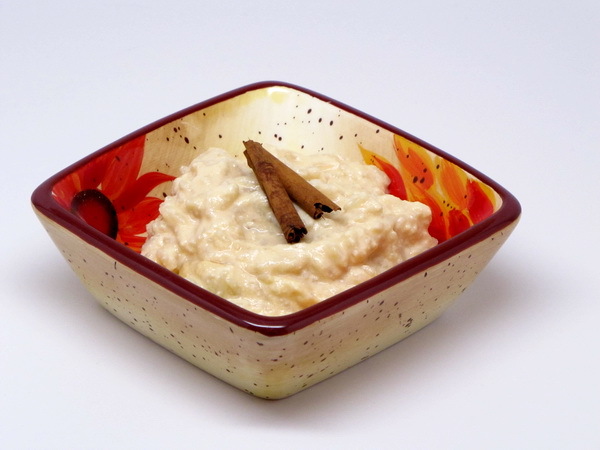 Take out the cinnamon sticks and throw them out, then spoon the pudding into desert dishes. Combine sugar and salt and sprinkle over the pudding just before serving.